I have been wanting for some time to see any version of Anything Goes I can manage to because I am such a big Cole Porter fan. The version I found is one of three featuring Bing Crosby in a lead part. He starred in the Broadway play, a 1936 version and this one, which has a different plot than the other two. 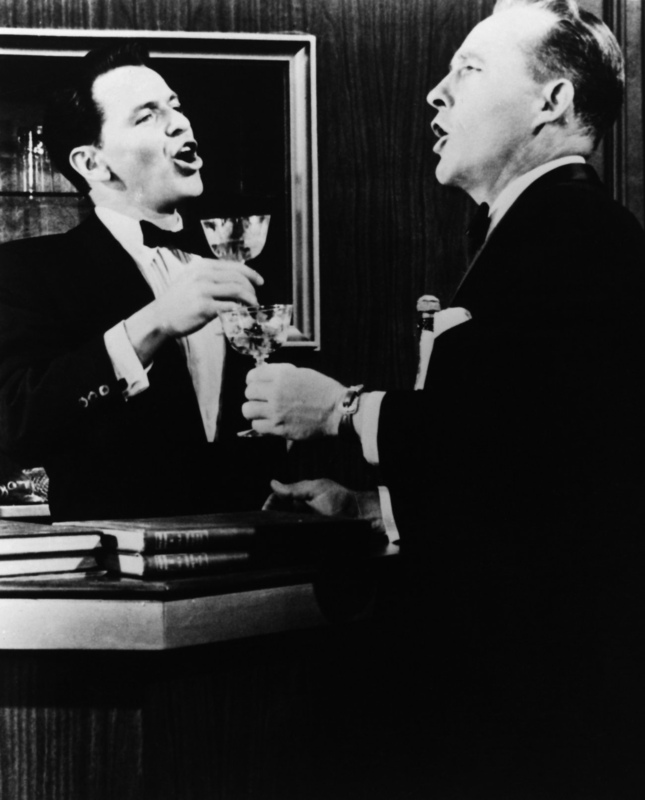 In this instance (1956), Donald O’Connor teams with Crosby (Imagine my delight!) in a story that pits the two men against two women, in a way. Crosby as Bill Benson is a big-time song-and-dance stage star and is looking to make a show that requires another strong male lead and a woman. O’Connor’s Ted Adams is a new star to the scene who thinks he is doing the old man a favor by starring in his show. The two basically agree that Bill will find the leading lady, but when they both visit Europe, each signs his own girl. Ted has found a French dancer to play what was supposed to be an American role and signs her to a contract. Bill discovers an American in England who wows him during a musical revue. The two couples meet up on a boat back to the states already aware that they have hired conflicting actresses. Ted is meant to drop Gaby (Jeanmaire) before boarding but fails to, while Bill is forced to hide the other woman from his discovery, Patsy (Mitzi Gaynor). The men end up falling in love with the woman the other had chosen for the role, but still seem to agree Patsy is best for the part. The gang also hits trouble when the arrival of Patsy and her father (Phil Harris) in New York means the old man will be arrested for past tax crimes. Anything Goes is marked by fantastic dance numbers and songs, as would be expected from the leading men. Ballerina Jeanmaire is a welcome addition for her dancing talent far more than for her acting skills. She is also disappointingly unattractive, which makes it easy for the audience to favor Patsy for the job while making the romance between Gaby and Bill unfulfilling. The Cole Porter songs, however, do not disappoint. The routine for “You’re the Top” utilized an amusing screen divide of sorts as the respective professional couples rehearse in side-by-side rooms while singing the same song to each other. O’Connor and Gaynor engage in an entertaining romantic melody of “Delovely” while dancing on the more functional portions of the steamship, including the railing. I enjoyed this version of Anything Goes but would have loved to see the Gaby part cast differently because I found her so intolerably undesirable. The story is otherwise charming and romantic at parts and a cute reimagining of the story that suits Crosby and O’Connor well. I am never one to pass up a Bing Crosby musical, but that is not to say a Bingo flick is a guaranteed smash hit. With A Connecticut Yankee in King Arthur’s Court I find my stance goes against the grain of opinions at the time the film was released. Although I truly fought the instinct to turn the movie off, moviegoers in 1949 loved Bing’s designated Technicolor extravaganza of the year. The singer was a huge draw in the 1940s no matter if the subject was a large- or small-scale production. The movie also earned Director Tay Garnett a shot at a nonexclusive contract with Paramount, which he regrettably turned down. I have never been a huge fan of subject matter that occurs before 1880, so perhaps the medieval theme deterred my fascination with A Connecticut Yankee. Perchance it was the song selection, which I found a bit dull and arbitrarily sprinkled throughout the story. Maybe the story was just a bit too haphazard to maintain my attention. Regardless the reason, I found myself disappointed. Crosby plays a 1905 blacksmith/auto mechanic who recounts the story in flashback. Somehow while in his home state of Connecticut, a lightning storm knocks him from a horse and leaves him unconscious only to wake to a Camelot knight poking him in the chest with a lance. Crosby’s Hank takes little convincing to believe he truly has been transported to 528 A.D. England, and the stranger is whisked to the presence of an aging and ailing King Arthur (Sir Cedric Hardwicke). The knight who has captured Hank, Sir Sagramore (William Bendix), tells a tall tale of how the beast transformed from ogre to dragon to his current form, and Arthur declares Hank must be burned at the stake. Just before his intended demise, however, Hank uses the glass from his pocket watch to ignite a bit of paper, convincing all, including Merlin, that he is a sorcerer, thus securing his freedom. Having hence been knighted, Hank mingles with the “people of quality” in the castle and courts Rhonda Fleming‘s Alisande, who happens to be betrothed to Sir Lancelot. Merlin, an evil character, sends for Lancelot when he sees the couple kissing to ensure a hasty end to Hank’s visit. Lancelot engages Hank in a joust, but knowing he can either run away as a coward or die as a hero, Hank opts to clamor unarmed onto a smaller horse (the one that traveled with him from Connecticut) and out maneuver the iron clad knight. He lassoes the man and makes a fool of him, which only drives Alisande into her fiancée’s arms. Next, an experience with a poor family who has seen naught but the ill favor of the throne inspires Hank to ask King Arthur on a common-man’s journey to London. Dressing as vagabonds, Hank, Arthur and Sagramore (who has been Hank’s servant) wander about while Merlin plans their end. The trio is captured, sold as slaves, escapes and faces beheading before Hank can use a solar eclipse –described in the modern almanac he carries– to convince the spectators of the group’s true identities. We are given no explanation as to how Hank happens to return to his home time, but one has to question why Hank made no effort whatsoever to find a way back. He seemed utterly content to act as a blacksmith and inventor thousands of years before his correct era. I found the story line to be a bit fragmented also. Besides the romance plot between Hank and Alisande, the modern man’s adventures are rather scattered and unconnected. If one ascribes to the theories of time travel that suggest any change in the past will forever alter the future, Hank sure is screwing things up. He “invents” a safety pin and pistol, alters Arthur’s role as king and introduces scandalous dance moves and music to the medieval people. The story is based on the Mark Twain novel, but being ignorant of that work I cannot offer a comparison of the drama. The book must have been popular as movie versions were make several times, with this being the musical adaptation. I generally am not much of a fan or celebrater of Xmas and I particularly dislike the classic songs that accompany the holiday from November onward. So for me to be fond of a film with the December tradition in the title is a bit of a rarity. I discovered White Christmas, oddly enough, during a summer showing a couple years ago at the Ohio Theatre in Columbus, where classic movies are projected on a big screen at the electric pleasuredome for a couple of months each year. I sought it out through a growing admiration of Bing Crosby and found my loyalty to the actor supremely rewarded. What I enjoy greatly about White Christmas is that although the holiday found its way into the title, the movie is not at all about it. The plot happens to take place around Xmas and the most famous song from the film happens to share the title, so thus we have White Christmas. It follows two army pals (Crosby and Danny Kaye) who went into show business together and a scheme to brighten the existence of their former general, who now owns a floundering country inn. Along the way they take on a sister act with Kaye’s character, Phil, instantly falling for Vera-Ellen‘s Judy. An adorable, complicated romantic plot develops between Crosby’s Bob and Betty, played by Rosemary Clooney. The picture is bolstered by the music of Irving Berlin, who ranks among my favorite song-writers. 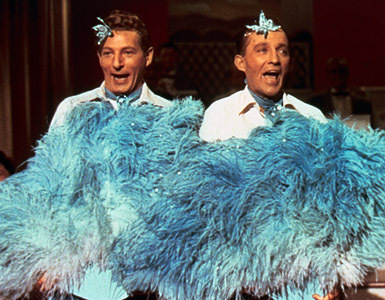 Outside of “White Christmas”, the movie also offers the goofy “Choreography” number and seasonal tunes such as “Snow”. In fact, I have “Sisters” stuck in my head as I am writing this. It is a fabulous soundtrack, and I would argue that Bing Crosby should be the only person permitted to sing the title tune — that mellow baritone voice of his compliments it perfectly. White Christmas was also how I came to adore Clooney (who, if you’re wondering, is the aunt of George). Her character is supposed to be the dowdier of the two sisters, but standing next to anorexically thin Vera-Ellen, Clooney’s curves make her the more appealing of the duo from my standpoint. Nevermind that her voice is absolutely awesome. Just try sitting through the “Love, You Didn’t Do Right By Me” number and tell me you don’t love her. White Christmas is set for 8 p.m. ET Dec. 16 on AMC. I have always considered myself a fan of musicals, but in recent years I have discovered I am a bit choosy on that front. For instance, I cannot stand The Sound of Music or South Pacific and was fairly bored with The King and I. If Kathryn Grayson is singing in a picture, forget it. I really enjoyed Show Boat, but I literally fast-forwarded through her songs. High Society, however, was the perfect combination of elements for me. Not only does it feature some of my favorite singer-actors, Frank Sinatra and Bing Crosby, but offers Cole Porter songs (my favorite songwriter) and the glorious Grace Kelly in her final role before becoming Princess Grace and in her only on-screen singing spot. Add in Louis Armstrong as himself, and this had no choice but to be a favorite. The story is a musical version of The Philadelphia Story that transplants the action to Newport News, New Jersey. The dialogue is identical in many cases, yet the roles seem to fit the respective actors perfectly. I understand that many people will side with Philadelphia Story when presented with this adaptation, but I saw High Society first, so I am biased. I definitely enjoy the original that transformed Katharine Hepburn from box office poison to gold, but why not go for the version with songs?